Looking for new Appliances review, recipes & inspiration? Our blog is full of tips,tricks, recipes & kitchen gear reviews. Are you interested in making high-quality meals at home? Do you have the right equipment to make anything you want with the same level of quality that you would get at a restaurant? What about if you wanted a grilled sandwich? Would you be able to make one yourself? One of the best pieces of kitchen equipment you can buy is a panini press, and today I’ll be educating you all about why this versatile machine should be sitting on your kitchen counter. Also, we’ll take a look at some of the best panini presses on the market to help you find the right model for you. 10" x 8" nonstick grids. Polished Stainless Steel Exterior . What is a Panini Press? If you’ve never had a panini, then you’re missing out on life. Simply put, a panini is a grilled sandwich, meaning that you can put whatever you want on the inside (meat, cheese, and veggies) and grill it to perfection. Although these devices are built to make paninis, that’s far from the only thing you can use a panini press for. How to Choose the Best Panini Press? To maximize the level of versatility that you can get with a panini press, you will ideally choose a model that has a floating hinge. While this feature sounds a bit exotic, all it means is that you can adjust the height of the grill plates to accommodate food items of varying size. Some panini presses only have one height or setting, which can be limiting with regards to what all you can cook. The best panini presses will have a floating hinge. Another key factor you should look at is the thermostat. You want to be able to adjust the overall temperature of the grill so that you can cook your sandwich (or whatever else) to perfection. Maybe you just want to sear the outside and leave the middle relatively warm (not hot), or perhaps you want to cook everything all the way through. An adjustable thermostat will enable you to cook your way every time. As I said earlier, you don’t want to buy a whole machine for just one purpose. That being said, since a panini press will sit on your countertop, you want to make sure that you have enough space to accommodate it. Some models are compact and can fit almost anywhere, but that also means that you are limited with regards to what you can cook﻿﻿﻿ on it. A larger press will give you more range, but it takes up more space. Keep in mind how often you will use the press and that should help dictate the overall size you should get. As with any cooking materials, your panini press will get dirty. However, you don’t want to have to spend time tirelessly scrubbing the inside of your press if you don’t have to. Some models will come with removable plates that you can take out and put in the dishwasher for maximum convenience. 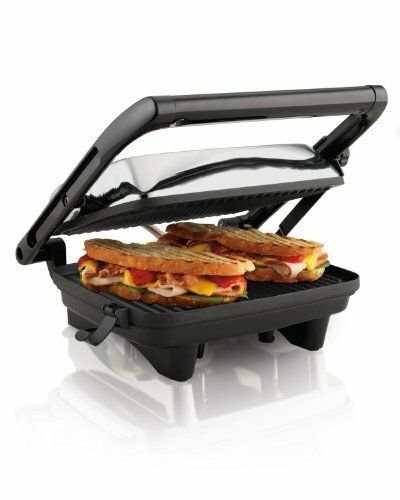 First on our list is the Oster CKSTPM6001-ECO Panini Maker and Indoor Grill. Name aside, Oster is one of the top brands making kitchen equipment today, and the 6001 Model is a perfect testament to the brand’s overall performance and quality. What makes this one of the best panini presses is the level of versatility that you get. Not only does this grill have a floating hinge to allow you to cook multiple size items, but you can also open it up and use it as a flat grill for cooking meats and veggies if you want. In fact, this model can cook up to 20% faster than other panini presses. What also sets this grill apart from the rest is the fact that it uses a ceramic coating to provide non-stick performance every time. Teflon pans work well, but the coating will wear off much sooner than ceramic, and you also run the risk of being exposed to harmful chemicals. The non-stick surface makes cleaning a breeze, as does the removable drip tray. To help reduce the amount of grease, you can also adjust the feet at an angle, so everything falls into the tray for less fat and better cleanup. Holds up to six slices at a time. Cooks up to 20% faster than other models. Non-stick ceramic coating for easier cleaning. Items in the drip tray may burn while you cook, meaning you may have to remove the tray while in use. In rare cases, the grill may not cook items evenly. Next, we have the 25460A Panini Press from Hamilton Beach. When it comes to panini presses, you usually have two options: the first is to have an adjustable thermostat to allow you to cook different items, and the second is to get a unit that has one preset temperature that’s optimized for grilling sandwiches and other such items. The 25460A is one of the latter options, meaning that you can only really use it for paninis and quesadillas. Despite the lack of customizable cooking options, this panini press is still quite good at making a high-quality grilled sandwich. It still has a floating hinge, however, which means that you can make sandwiches of different sizes without any problems. Its compact size means that it takes up less counter space and is much easier to store, although you can only cook two or three sandwiches at a time. I would recommend this model for anyone living in an apartment or by themselves. Cleaning this press is relatively easy, as deep ribs help drain fat and excess food particles, and the plates themselves are non-stick. Our next panini press is another model from Oster, the better named DuraCeramic Panini Maker and Grill. This model is relatively similar to the other Oster press above, but it does have some key differences concerning how well it cooks and how easy it is to clean. One big difference between this and the other Oster Panini Press is the size. This model is more compact, which makes storage much simpler, but it also limits how much food you can make at one time. Also, this model does not have a floating hinge, so you can potentially make a sandwich that is too large and will get squeezed out as you press it. What is nice, however, is that you can still use it as an open face grill for meats and veggies. It also has an adjustable thermostat, so you have better control over your cooking. To help with cleanup, you can adjust the feet to drain all excess fat, which is then caught by two separate and removable drip cups. There is also a cleaning tool included to assist in getting any stuck on food. Thankfully, that shouldn’t be much of a problem thanks to the grill’s ceramic nonstick surface. Slick coating means that your sandwich may slide forward when pressing down. No floating hinge means it doesn’t accommodate all sandwich sizes. If you ever watched television in the late 90’s, then you heard about the George Foreman Grill. Every commercial break it seemed that the ex-boxer was telling you about how awesome his product was. Thankfully for us, though, he was right. The GRP4842P 3-in-1 Evolve Grill is one of the best models offered by Foreman and for good reason. As the title would suggest, what makes this one of the best panini presses on the market is that you can use it for multiple purposes (three of them, in fact). In addition to paninis, you can use this machine as a regular George Foreman Grill or as a waffle maker. To achieve this effect, there are three sets of removable plates, each designed for a different function. Also, this machine has a floating hinge so that you can cook a wide range of different sized foods. What I like about this grill is the digital control panel on the front. Adjusting the temperature and switching between cooking methods is super easy and simple, and there’s even a searing option so you can get the best paninis and steaks possible. Cleaning is a snap with this grill since the plates are removable, dishwasher safe, and completely non-stick. Also, as with all George Foreman Grills, all grease and fat drain out while you cook to make your meals healthier and cleanup that much easier. Our next model is another straight up panini press. 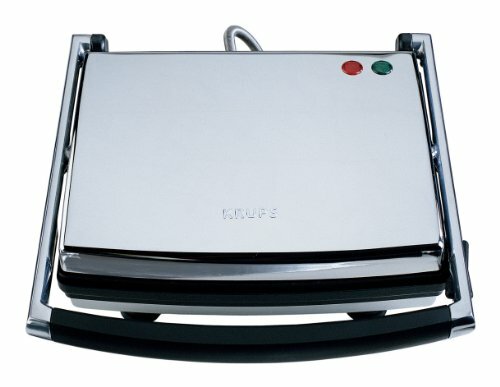 Unlike the George Foreman Grill or either Oster model, the KRUPS FDE312 (why are all these names so complex?) Universal Grill is designed for one thing: to make paninis. While you can still use it for other items like quesadillas or meats, this grill is not exactly “Universal”. grill different than other panini presses, however, is that the plates are completely flat, not ribbed. If you like your paninis with grill marks, then I’m afraid you won’t get them with this model. Other features of this press include indicator lights to know when to start cooking, a slim profile for easy storage, and non-stick surfaces for easier cleaning afterward. Flat surface means your food sits in its own grease and juices. Another top brand in the kitchen appliance industry is Cuisinart. While most people think of Cuisinart with regards to food processors or mixers, the fact is that the company makes a mean panini press as well. This is another “plug and go” model, meaning that you can’t adjust the temperature and use it as a general indoor grill. The GR-1 is a durable panini press and is made of high-quality stainless steel and metal. This model features a wide surface area so you can make multiple sandwiches at once, and a floating hinge also means you can make your sandwiches as big as you want them. Cleaning the GR-1 is simple since the surfaces are non-stick, and it even comes with a cleaning tool to help you remove food from the ribs of the grill itself. Also, this unit comes with a threeyear limited warranty. In some cases, burned food may stick to the surface. In rare instances, the grill plates may not cook evenly. Next, we have the VillaWare Panini Grill. Why all kitchen appliance brands choose to give their products long, complicated names with random numbers and letters is beyond me, but nonetheless, this is one of the best panini presses out there. Like the Oster models, the VillaWare Panini Grill is designed for multiple uses and cooking styles. You can use it as a straight sandwich press (although there is no floating hinge on this model), or you can open it up and use it as an indoor grill for meats, veggies, and anything else you can imagine. Cleaning this model is super easy since the plates are removable and non-stick. Also, storing this machine is a breeze since the top locks in place, and you can store it vertically. Overall, this is a great addition to any home that wants a better cooking option than just the stove or microwave. Temperature control can take a little practice to master. 08. 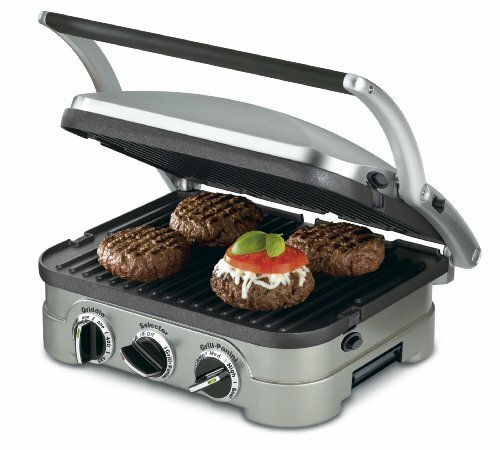 Cuisinart GR-4N 5-in-1 Griddler. speaking you can only use it one of two ways. The other three cooking methods refer to the fact that you can use this grill as a press or open-faced. The most notable feature of the GR-4N is the fact that you can use it as a griddle or a grill. There are three knobs on the front: one for griddling, one for grilling, and the center knob switches between the two. To get the effect of a griddle, you simply turn the plate over for a flat surface or leave the ribbed side up for grilling. As I mentioned above, you can also lay this machine out flat for more surface area while cooking. Cleaning the GR-4N is a snap since you can remove the plates and they are non-stick. The profile of this machine is a bit wider than most other panini presses, but that’s because there is a drip tray underneath. This feature does work, but you have to push the grease into the drip slot unless you want to be splattered by hot oil. Overall, this is one of the best panini presses you can buy.If you’re planning to make some grilled sandwiches for your next camping ,Rome’s 1305 Panini Press will really come in handy, and Adventure Gears Lab is one site that explains its features in such a detailed way. In rare cases, the non-stick coating may peel off. Locking clips are made of plastic, in rare instances, these may melt. 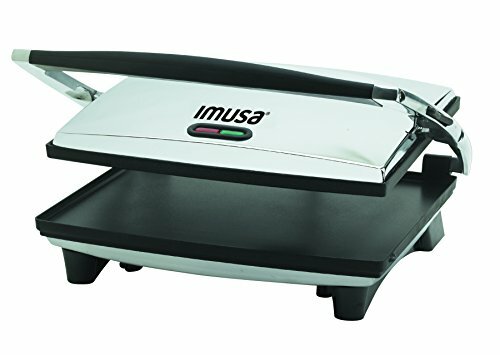 Our next best panini press is another “plug and go” model from IMUSA. The GAU-80102 Model is made specifically for paninis, although you can use it for other sandwich-style items such as quesadillas or even burritos if you were so inclined. floating hinge allows you to prepare any size sandwich you want, and a large surface area means you can cook multiple items at a time.Cleaning this product is easy with its non-stick surfaces that wipe down after each use without any trouble. Storing the GAU is also simple since you can lock the top portion in place and store it vertically wherever you want. 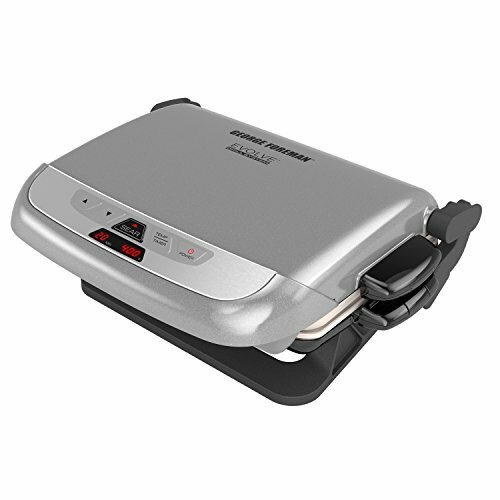 Our final panini press is the George Foreman GRP4800R 4-in-1 Grill. Much like the other George Forman model on this list, the 4800R is a multi-plate grill, meaning that you can use it for a wide variety of purposes, not just cooking paninis and such. 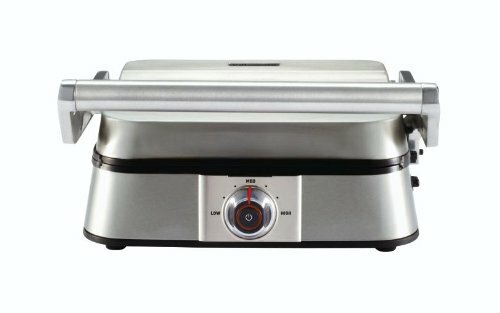 In addition to making some of the best grilled sandwiches, the 4800 comes with a grill plate for cooking meats and veggies, a muffin plate for cooking muffins and cupcakes, and a waffle plate for making exceptional waffles. Overall, you can use this versatile machine for breakfast, lunch, and dinner, all without ever having to go to the stove or oven. Other notable features of this grill are the adjustable feet so you can drain the grease and fat while cooking, the floating hinge so you can accommodate any size sandwich or cut of meat, and the easy to use control panel that allows you to cook exactly to your specifications. Overall, this grill has everything you need to get the job done. Muffin baking is not as good as it should be, meaning that sometimes the muffins may come out soggy in the middle. Waffles can also be a little undercooked in the middle at times. In rare cases, the ceramic coating may chip and peel after repeated use. When picking out the best panini press, I would highly advise choosing a model that gives you multiple options for cooking. If all you want is a panini, the best models on this list are the Cuisinart GR-1 Panini Press or the Krups Model. However, if you want versatility and performance, I would highly recommend either the George Foreman 3-in-1 or the Cuisinart 5-in1. I love that the George Foreman model has different cooking plates to use and a digital control panel. For the Cuisinart, however, I like that it can open up to a full grill, and you can use it as a griddle, grill, or press. 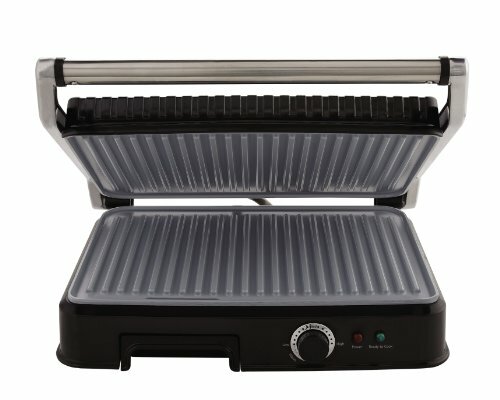 Overall, these are the best panini presses in my mind, but all of the models on this list are highly rated and will satisfy your cooking needs.